Hello all, and welcome to week 1 in our series for Advent 2016: Anticipating Joy! There is no formal structure for these, it's just a place for us to leave our thoughts and aspirations for each week of Advent this year. I am using a few different Advent devotionals right now, including Advent with Saint Teresa of Calcutta: Daily Meditations, and Goodness and Light: Readings for Advent and Christmas. I have been enjoying reading them in the evenings, and have been using them to keep things in mind as I proceed about my days this Advent. I also purchased a copy of the Living with Christ Prayer Journal 2017, and I started it this past Sunday, for the 1st Sunday of Advent. This is not a daily journal, but a weekly one, corresponding to the Sundays of the liturgical calendar and the Mass readings. And it occurred to me that each entry has a little prompt for us to use in these posts. That's a yay! So I'm going to use those for this 4 week series. Let's get started with our first one! Paul tells us to put aside godless ways and live in God's light. What attitude or action should I reject this Advent? Don'cha love it?! I really like this little journal. There is also room to write down names to pray for that week, and there's a reflection to read. I live for this stuff. But back on track... For this prompt, I wrote down:disquiet/frenzied worry and anxiety. Frenzied is a word that I often think of when the holiday shopping/meal planning season comes to mind. And I really want to work to avoid that. 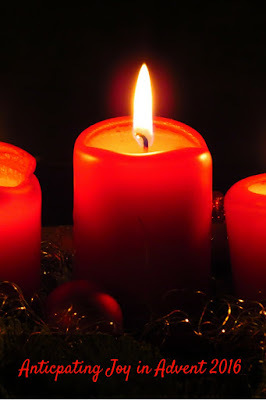 I want Advent to be a season of contented, reflective contemplation, and anticipation of Christmas. For the past 2 years, our priest has chosen to process into Mass during Advent without an opening hymn. He and the altar servers walk in in silence, and then take their seats on the altar to quietly pray for a few moments before Mass begins. I am loving this, and I think it feeds into the sentiment I described above quite well. That is my goal for the week: To be internally quiet and peaceful, and not give into the chaos that emotional turmoil and anxiety bring. What is YOUR response to this Advent prompt? I would love to hear all about it in the comments! I wrote down discouragment when I sat with the prompt on Sunday. This semester has been so crazy that little things had been tripping me up and discouragement was setting in easily. Instead, I am trying to roll with changes that come up and choose joy. Sam, GOOD ONE. I felt discouraged quite a lot this semester. I've been working hard this month to feel back in my groove and optimistic again. I want to fully embrace the joy of Advent, despite the hurry and rush and your word - frenzy - of this season, I want to remember that no matter how hard I try, I can't be all things to all people, but Jesus can, holding that in my heart and sharing the Good News!